And the brightest star that is in the land is Molly Bawn so fair. We’d drink good liquor merrily and pay before we’d go. I would roll you in my arms, Molly, let the winds blow high or low. An organization in Ireland called the Bird Song Project is celebrating traditional songs about birds with a series of concerts and song sessions this month. I had a look through my to-do list of songs for something fitting and found this one from Minnesota singer Michael C. Dean’s songster The Flying Cloud. 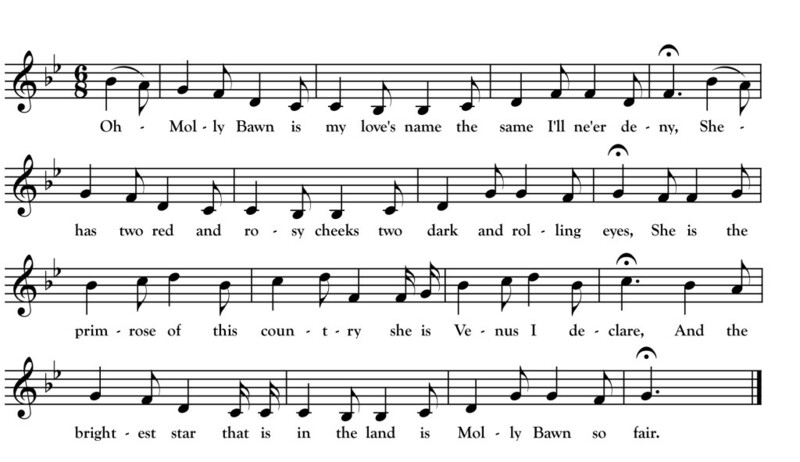 It is not a song about birds but, in the process of praising the beauty of “Molly Bawn” it does invoke three species that will be familiar to anyone who loves old songs: the cuckoo, turtle dove and nightingale. The above song is not related to the other “Molly Bawn” song in which Molly is mistaken for a swan and shot by her deer hunter lover. It shares most of its poetry with versions of the broadside “The Irish Girl,” a ballad with many “floating” lines and images that turn up in other traditional songs (including “I wish my love was a red, red rose” which is missing here). We don’t know what melody Dean used for this song as The Flying Cloud is text only. I chose to borrow an air from the song “Wee Paddy Molloy” as sung by Brigid Tunney which I think fits quite well.